I read Brian Selznick's WONDERSTRUCK upon hearing that his screen adaptation would be playing the BFI London Film Festival and immediately fell in love with it. So many of its themes resonated with me - from the fear of having no place to fit in in society; to the love of collecting and old books; to the delight in architecture and models; and most importantly of all, a captivation with the history of cinema itself. And that's all before one realised that this was going to be a profoundly beautiful treatment of the challenges and triumphs of growing up deaf. Added to its thematic richness, Selznick's book was truly beautiful, unique and imaginative. He intertwines two stories of two kids from different eras - a girl called Rose living in 1920s New Jersey, and a boy called Ben living in 1970s Minnesota. Rose's story is told in beautiful black and white pencil drawings and depict a world of silent movie stars and the golden age of New York. Meanwhile Ben's story is told in text, but text that is beautifully and deliberately typeset. As the stories later meet and mingle, so to do the formats. The result is a visually stunning book. 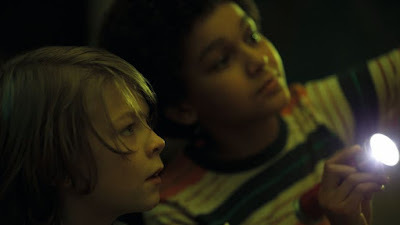 Acclaimed auteur Todd Haynes admitted in his introduction to this film that he wasn't the obvious director for such a book at first glance - this is his first film aimed at a younger audience. But when one considers its fascination with cinema history, who better than a director who has reinterpreted Sirkian melodrama for modern audiences? WONDERSTRUCK demands a director who is comfortable in different eras and styles, and who can harness the powers of pure cinema - visual, sound design, music - to convey emotional journeys and suspense. And this is what we get in this film. In Rose's story, huge attention has been paid to texture - her hair, the patterns on her clothes, the thick ribbing on her tights, visually echoing the cross-grain drawings in the original book. And there's a delight and wonder at the stunning architecture of New York - we see it afresh in her eyes. Millicent Simmonds - a talented deaf actress in her screen debut - is captivating in the part. In Ben's story I feel Haynes really added to Selznick's world, showing a grittiness and griminess to pre-Giuliani New York and using music cues to great effect. In fact, Carter Burwell's score is one of the most impressive thing about this film, and holds the disparate themes together. I can see why some people have been less than impressed by WONDERSTRUCK. It is patient and deliberate in how it unravels its story - the plot reveals depend on "big" events happening that may feel too many or too obvious - and its essentially a rather melancholy story about loss. But I also feel that it's a deeply moving story about finding one's place in the world, triumphing over loneliness, and forging one's own path. And I must admit that the final half hour had me in tears. Fans of the book will not be disappointed, and I feel that in the technical brilliance of the film, neither will Haynes fans if they open themselves up to the young adult material. After all, aren't so many of his films about misfits struggling to find a place in oppressive bourgeois conventional society? WONDERSTRUCK has a running time of 117 minutes and is rated PG. The movie played Cannes, San Sebastian, London and New York 2017. It opens in the USA on Oct 20th, in Hong Kong on Oct 26th, in France on Nov 15th, in the Netherlands on Dec 7th and in Belgium on Dec 20th.